The West Highlands in particular, have some of the most dramatic coastlines in the UK (and arguably the world) which are as appealing under a blue, sunny sky as they are in the middle of a winter storm, with waves crashing against the rocks. 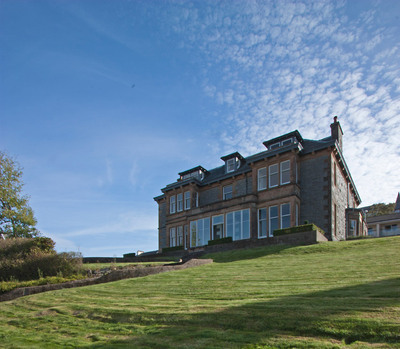 House Parties, the UK leading company offering spectacular mansions, many with dramatic settings and views, has a choice of nine properties in Scotland for those who want to discover the region for themselves, whilst celebrating a special occasion. Balvonie House is an imposing mansion at Skelmorlie in the Muirshiel Regional Park, overlooking the Isle of Bute across the sea (45 mins. from Glasgow). The property sleeps up to 26 people in 11 bedrooms and is decorated to the highest standards throughout in a modern, contemporary style. Some of the highlights include a huge dining room that can seat 22 people at one table, a games room with a full size snooker table and a hot tub that can seat 7 people, and a tree house. A three-night weekend stay costs from £130pp when fully occupied by 26 people. The Drury, in Oban, occupies a setting in the Firth of Lorn and the bay is a near perfect horseshoe, protected by the island of Kerrera, and beyond to the Isle of Mull. Perfect for any kind of group gathering including hen parties (sorry, no stags), the house – which is set in an elevated position with views towards the Isle of Mull – sleeps up to 22 people in 11 bedrooms. The house is beautifully decorated and outside facilities include two main seating areas, hot tub and a fire pit. A three-night break costs from £145pp, based on 22 people. High Wards, set in 98 acres and with access to the shores of Loch Lomond, is located just a few miles from Gartocharn. Set against a natural backdrop of tree-lined wetlands – and grounds so extensive you can safely land a helicopter on them – High Wards House is simultaneously spacious and intimate. Highlights include a heated indoor swimming pool, a pool table, kids’ play area (with trampoline, Wendy house, slides and swings), an all-weather tennis court, and a small private beach. A three-night break costs from £180 based on 21 people. Tursachan is a four-bedroomed (all en-suite) house located amidst lush green trees, near Aberfeldy, close to Loch Tay. The formal dining room comfortably seats eight people whilst outside a grassy terrace with a hot tub invites you to relax with a glass of wine under a star-studded night sky. A three-night break costs from £158 based on 8 people.